Dr MC Luthra, specialist in Lens Implant and Glaucoma, completed his medical studies in Ophthalmology from Agra Medical College in 1967. 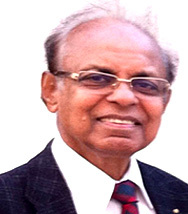 He joined ONGC as an ophthalmologist in 1968, during his working tenure in ONGC he brought up the ophthalmological department with latest equipment and medical practices. He took voluntary retirement from ONGC as Chief Eye Surgeon. In the year 1994, he established Drishti Eye Centre (currently known as Drishti Eye Institute), with a vision to fulfill the need for super specialty eye care services in the region. He conducted more than 1000 free eye screening camps in collaboration with Rotary Club & Lions Club Dehradun. He also conducted more than 200 free eye surgeries. Rotary International Cataract Surgery Project by Rotary International President, Carl Wilhelm Stenhammar. He has been a very active Rotarian and was awarded Best President Award District 3080 in 2012. He has been responsible for establishing two new rotary clubs in DehraDun. Past President of UP State Ophthalmic Society. Founder President of Uttaranchal State Ophthalmic Society. Prestigious Doctor Mohan Lal Memorial Gold Medal in UP state Ophthalmic Conference 1965. Lifetime Achievement Award at Uttaranchal State Ophthalmic Conference in 2008. Also chaired several scientific sessions at various national and state level meets.